It would be wrong to say that there was a bootlegger on every street in West Terre Haute. But the town that prior to Prohibition had many more saloons than churches had its fair share, and more. It was, after all, a thirsty town. Even before Prohibition there did not seem to be enough legal hours in the day to slake the town’s thirst. 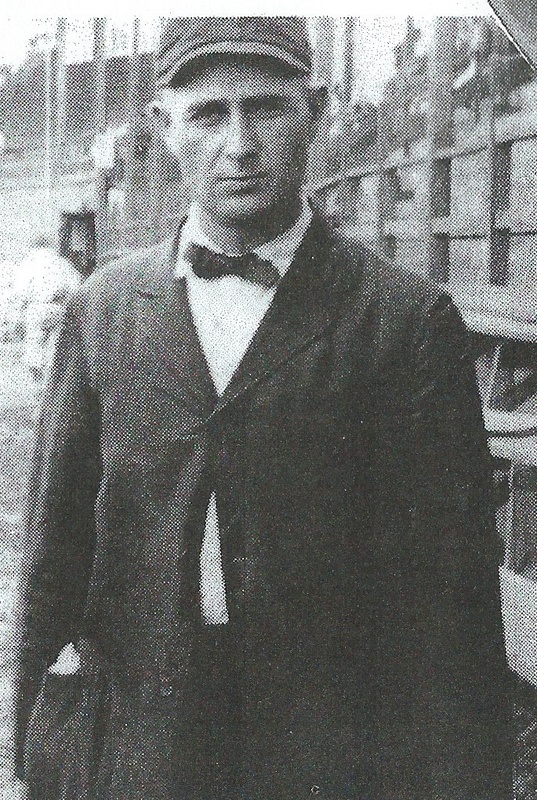 Town marshals were constantly on the prowl to enforce closing laws, as in 1904 when Marshal Ramsey Gess went on a crusade to dry up illegal sales. The subject of bootleggers (the term is thought to originate from the days when sailors would hide contraband in their tall boots to spirit a little comfort onto their ships for the long sea journey) came up during a recent oral history with C. Joseph Anderson. Joe, as he is known, is a prominent attorney, legislator and judge from West Terre Haute. He readily talked about his father “Peck” Anderson being a noted bootlegger. Peck was something of an entrepreneur. He owned several businesses, including a saloon, and was an early example of a house flipper. Though I had long heard that Peck distilled and sold his own booze, I was a little shocked to hear about one of the town’s other noted bootleggers, Acle Ellingsworth. Acle, you see, was father-in-law to both my uncle Art Chrisman and my aunt Eileen Ellingsworth. I knew Acle as only a man sitting quietly at gatherings. To hear that this taciturn man had an “infamous” past was quite a surprise. I had planned to visit Aunt Eileen anyway, but I drove immediately to see her. Now you must understand that my aunt is one of the sweetest ladies on earth. She is loath to speak or think ill of anyone. I assumed she would say little about it, or even deny it. She told me the story with a certain amount of relish. Acle, indeed, was a bootlegger. 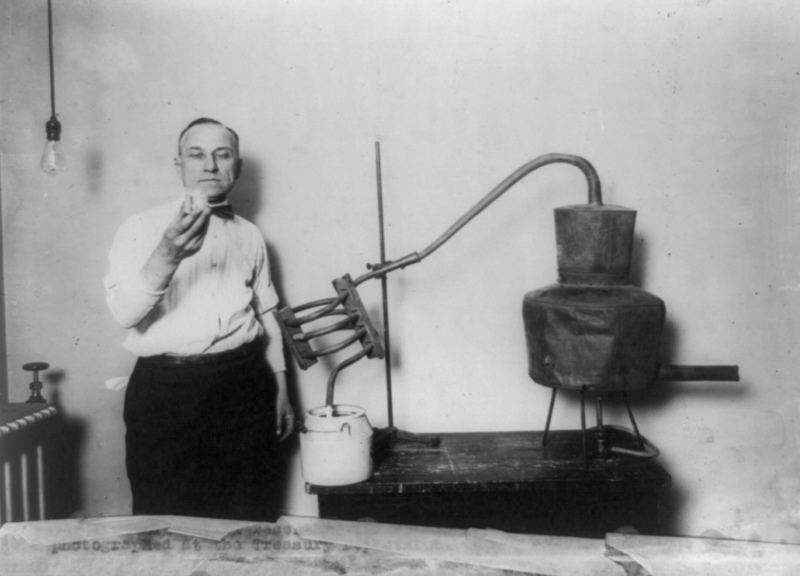 Being a tinsmith, it was nothing for him to whip up a still in his shed and set about being a minor Jack Daniels. He was not a gangster she averred. He made and sold small batches of whiskey, mainly to sell or give to his neighbors, or for his own consumption. He was not one who distilled great amounts to sell to rumrunners or supply a string of speakeasies, of which there were many in Vigo County. Some just up the street from his Paris Avenue home. And she proudly said, “He never used any money he made bootlegging for himself. He would use it to help out neighbors or family in need.” I almost thought she was describing a latter day Robin Hood, but if my Aunt Eileen tells you something, you know she believes it to be true. There were other small time “leggers” in West Terre Haute. Several times a month local papers would tell of another arrest of a West Terre Haute bootlegger. There was Andy Harper, who was sentenced to 30 days in jail for concocting his own potent potables, Leonard Hollobaugh who arrested for selling alcohol to 3 teenagers, one of whom was shot and killed as they raced down Fruitridge Avenur in attempt to evade the police, and even a woman, Helen Kintz. Like Peck and Acle, the small timers were mainly being entrepreneurial. But there was a much darker side to Prohibition. Regular readers know that I believe Prohibition to have been an ill-conceived, benighted, stupid and foolhardy attempt at social engineering. Foisted upon the majority by oft-times honestly concerned, but by a sometimes holier-than-thou vocal minority, it was not only an abject failure, but a disaster for the nation. (At this point do you get the feeling I do not think much of Prohibition?). There are many reasons that, as a professional historian, I take this view. 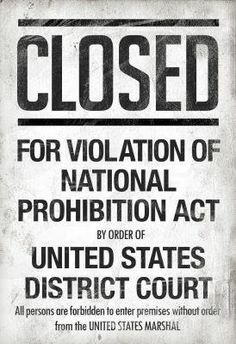 One is that the amendment immediately made millions of Americans, those who drank and those who made booze, criminals. Millions who had previously respected the law, became instant lawbreakers. Debates still rage as to how much this taste of disdain for the law effected future generations. If one winked at prohibition laws as one sipped a cocktail, what laws would one disregard in the future? The other major reason Prohibition was a disaster was the role in played in the rise of organized crime as we know it today. Yes, there were loosely organized gangs throughout America before Prohibition. But they were local. Prohibition was the crazy glue that cemented local gangs into a national web of organized crime. Of course, there were gang rivalries and untold slaughter along the way (for a fine history of this in Chicago see the excellent new book by Jonathan Eig, Get Capone), but ultimately the cooler gangland bosses learned to divide territories and work together. Thus was born modern organized crime (which, by the way only got worse nationally because J. Edgar Hoover did not believe existed until too late because he was too busy chasing supposed Commies). And this fitful rise of gangs and violence also played out on the street of West Terre Haute during Prohibition. In July, 1926, two West Terre Haute bootleggers, Oscar Moore and Alek Leclerq, were snatched off South Seventh Street. They were released the next day but returned home mum about what happened. They knew silence was not only golden, but their key to survival. Speculation was that they may have hijacked a load of booze belonging to a powerful, terroristic St. Louis gang known as the Egan Rats. In August, the still breathing Moore was speeding along a road in south Chicago with two companions, a Mr. and Mrs. Joseph Ronan. When police stopped them they found two pistols and a shotgun. They also found 60 gallons of illegal booze that the trio admitted they were transferring from Indiana (from the West Terre Haute area?) to gangs in Chicago. Thus was West Terre Haute a minor pivot point in the gangland empires. 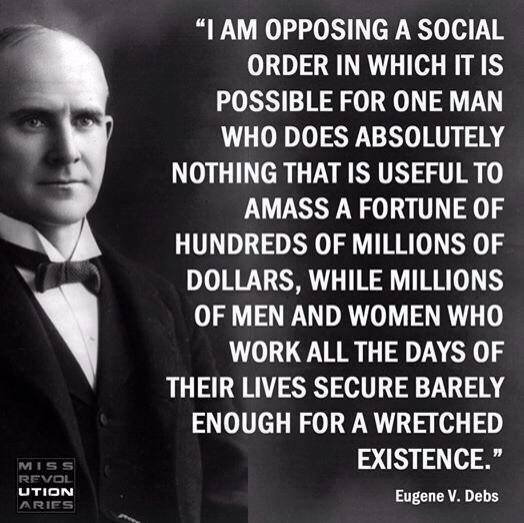 It is my belief that Eugene Victor Debs, of Terre Haute, Indiana, is one of the most under-appreciated socio-political thinkers and activists in American history. In an age when even the term “liberal” is an epithet to many, to be called a “socialist” can, in the fevered minds of some, place one on a continuum somewhere between heretic and puppy-slayer. Those who think that way have never studied Debs ore the roots of socialist thought. This is not the time to digress on the history of that thought. This is a human story about a friendship. Debs left school at 14 to work in the large Vandalia Railroad shops in Terre Haute. Later he rode the Vandalia’s rails as a locomotive fireman, shoveling coal into the fiery maw of engines that drove the American economy in so many ways. He joined the Brotherhood of Locomotive Fireman, which was essentially a fraternal, not, political organization. But over the years this deep thinker from the heartland more and more saw the inequities that all but shackled the working man and became more political. He was not alone in this transition to awareness of inequities. Again, this is not the place to detail Debs long career, suffice it to say he became a five-time presidential candidate of the Socialist party (and scored what is still today, one of the highest percentage of vote for a third party candidate), and was jailed during WW1 for supposedly violating the Espionage A for the “intention and act” of obstructing the draft. He was to serve over two years in federal prison While in prison he received nearly one million votes as a presidential candidate in 1920. But my story takes place long before this. John McKenzie was born somewhere in Ohio in 1871 to an Irish mother and a father whose birthplace was listed only as the “United States.” When he came to Indiana and West Terre Haute is unclear. He worked as a miner like so many others in the town. In 1900, he married Ada Long. Ada was the granddaughter of David Marion Arthur. This made her the cousin of my grandmother, Hilda Hants Chrisman. Though cousins, Ada’s husband John was “Uncle Mac” to my grandmother. John had something in common with my grandmother’s future husband’s family, the Chrismans. As I have mentioned in earlier entries, the Chrisman boys were all baseball players. My grandfather and his 4 brothers all played baseball as either minor leaguers or as semi-pros for various town teams. “Uncle Mac” loved the game and played five years of minor league baseball. He began his short and rather inglorious career with the Terre Haute team in the Indiana-Illinois league in 1899. The next year he was briefly a member of the famed Terre Haute Hottentots in the Central League (unluckily for him, the year before the “Tots” were part of the famed Three I league and featured future Hall of Famer “Three Finger” Brown). He played in only 7 games, hitting .310 (a fine batting average for a modern major leaguer, but barely respectable for a turnoff the century minor league batsman). But, he persevered out of love for the game. After a summer of playing local ball, he found himself back in the minors. From 1902 to 1904 he carried his glove and bat further west and played with the Flandreau Indians, Sioux City Soos, and Marshalltown Grays in the Iowa-South Dakota League. Once again, his ability did not equal his desires. His batting average did not rise above .274 for the rest of his career. Like so many, John McKenzie could not get baseball out of his blood. After his playing days he became an umpire, and a damn good one by all accounts. He was known as perhaps the best umpire in the Three I (for Indiana-Illinois-Iowa) league. The Three I was a step below the highest level of minor leagues, but it was a good one that saw many players leave their diamonds to grace Major League fields. So, how did this minor league umpire and the famous Socialist happen to come together? I do not know. Debs was known to speak before or after baseball games in West Terre Haute, spreading the word about his cause. Perhaps, “Uncle Mac” and “Gene” met then. At any rate, according to my grandmother, they became friends. And hunting buddies. Before WW1, Debs and Mackenzie would head to the woods around West Terre Haute to go squirrel hunting. After bagging their prey, they would head back to Mac’s house on National Avenue in West Terre Haute and clean the game. Walking triumphantly into the kitchen they would sit down to talk. As they did, “Aunt” Ada would fix them a favorite breakfast: squirrel brains and scrambled eggs. How often, and for how long, Mac and Gene did this is uncertain. Debs fame spread and Mac had his own life. He was a miner, a laborer and a cigar maker. His shop, which featured his hand-rolled specialty called a “John Mac” was located just below the railroad tracks on Market Street in West Terre Haute. John McKenzie outlived his friend Gene Debs by 49 weeks. “Uncle Mac” died on October 2, 1927, just days after the close of the epochal baseball season that saw Babe Ruth hit 60 home runs and the New York Yankees win the World Series.